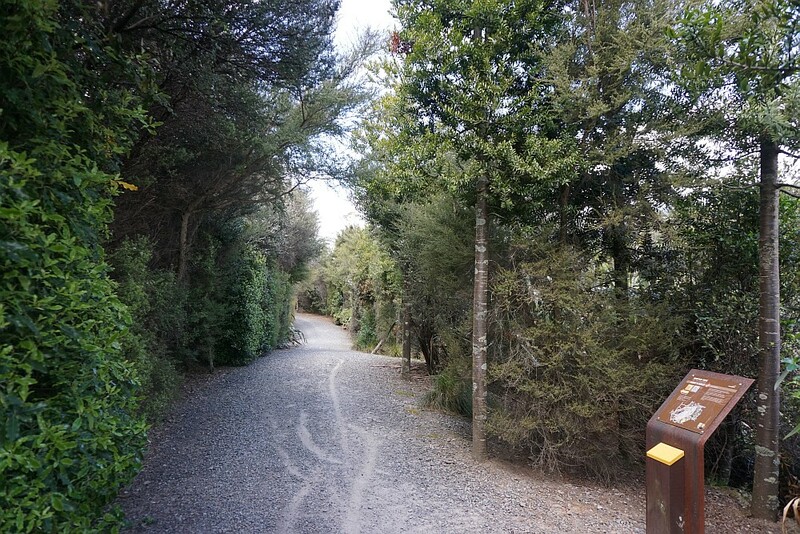 Access to the Pit Rim Walkway is available from several locations, including one across from the visitor and information centre on Seddon St. This also contains the Gold Discovery Centre. 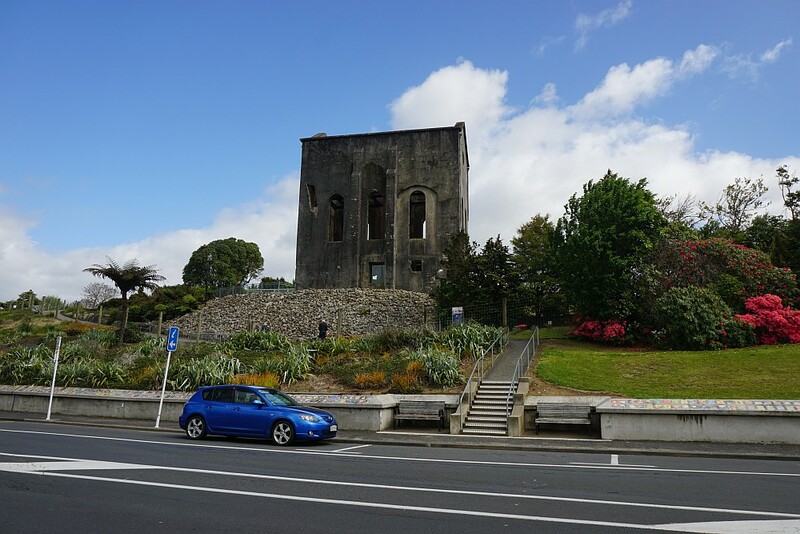 The Cornish Pumphouse building is a landmark for Waihi. 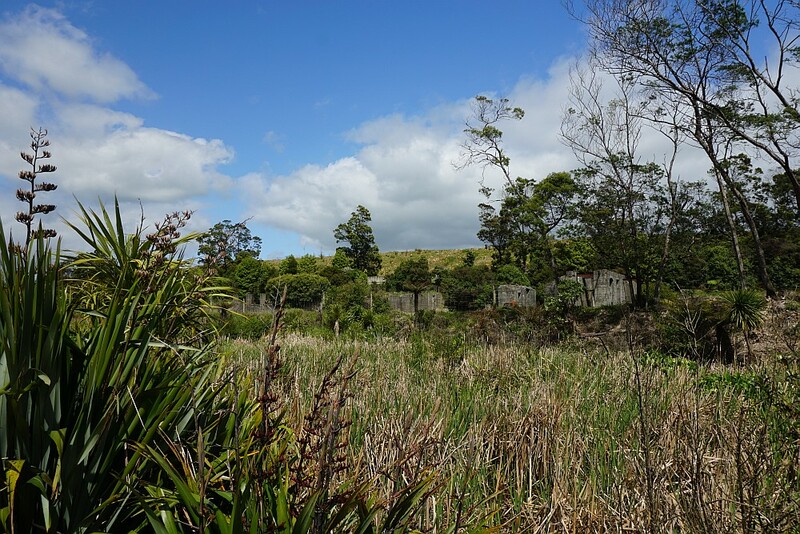 It was moved in 2006 almost 300m from its original site which was at risk of subsidence to its present location just across from the visitor centre. 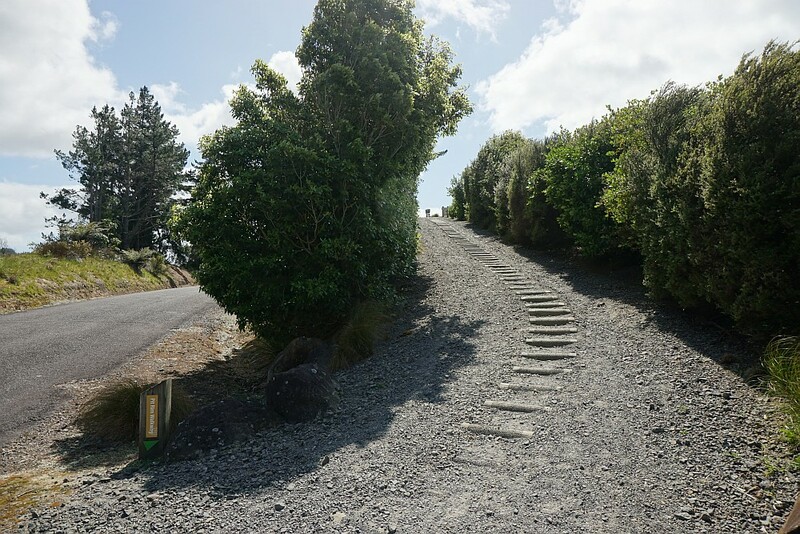 The steps lead up to the Pit Rim Walkway. 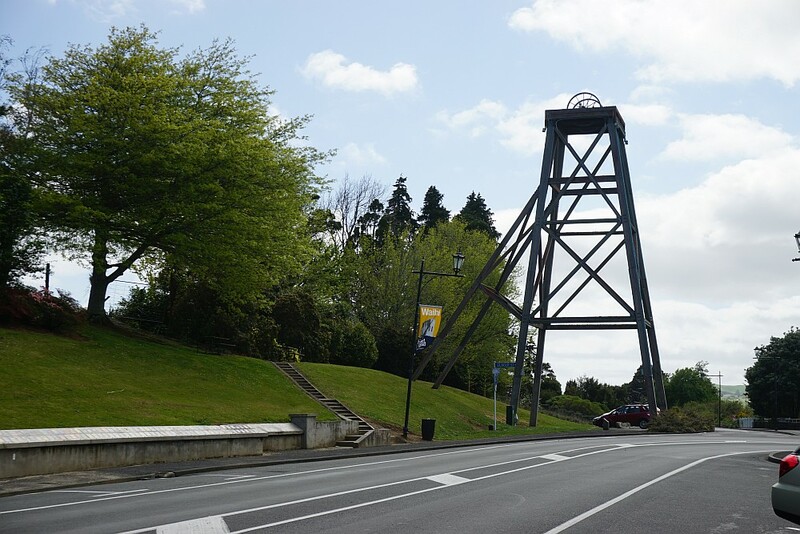 Another landmark is the winch head, used for the elevators in old mine shafts, visible from the visitor centre. 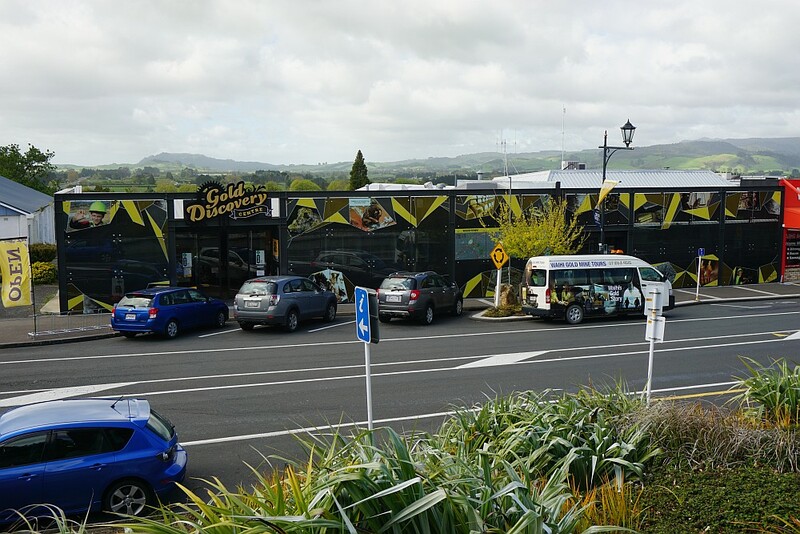 The visitor centre with the Gold Discovery Centre, across the road from the Cornish Pumphouse. 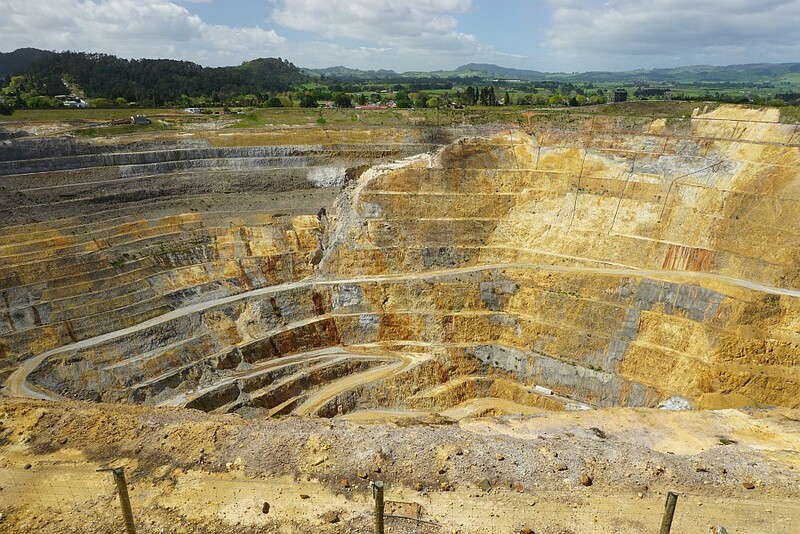 Tours of the gold mining operations are available twice a day. The Cornish Pumphouse building. 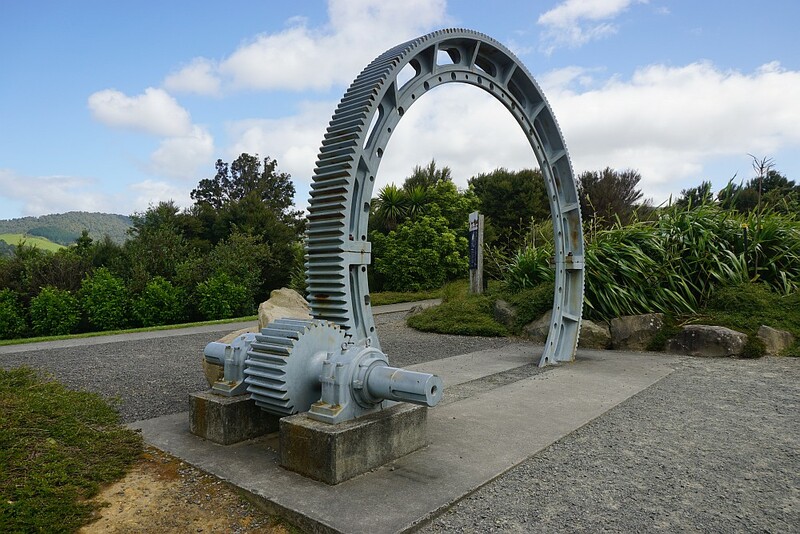 Originally constructed in 1903 and retired in 1913 when electricity took over from steam for pumping water out of the mine shafts. It could pump 7,000 litres of water every minute out of the 399m deep shaft. 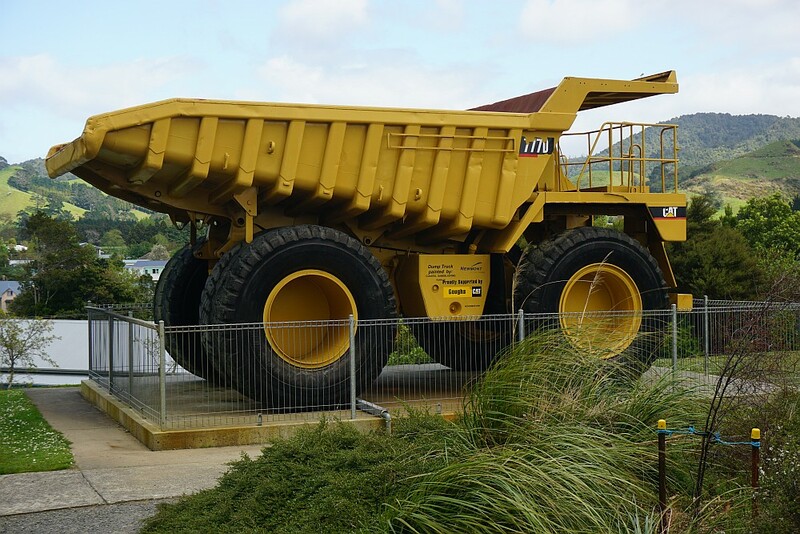 One of the trucks used to collect ore from the open pit mine and transport it to the conveyor belt which moved it to the processing plant. 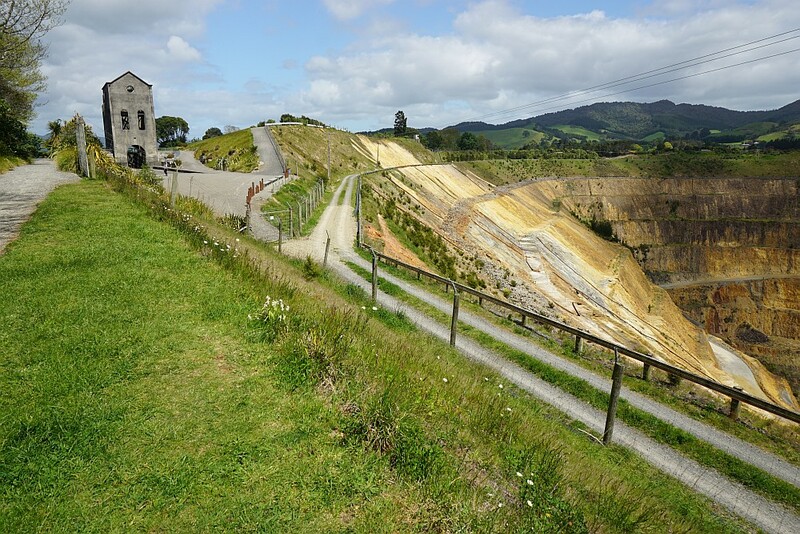 The large cog wheel surrounded and turned the drum used to pulverise the ore.
A gentle slope makes up the steepest part of the walkway, leading to the lookout on the north-western edge of the open pit mine. Looking down into the mine pit from the lookout. Slips on the pit walls have closed the mine temporarily. The trucks are all waiting in line for the pit mine to open again. 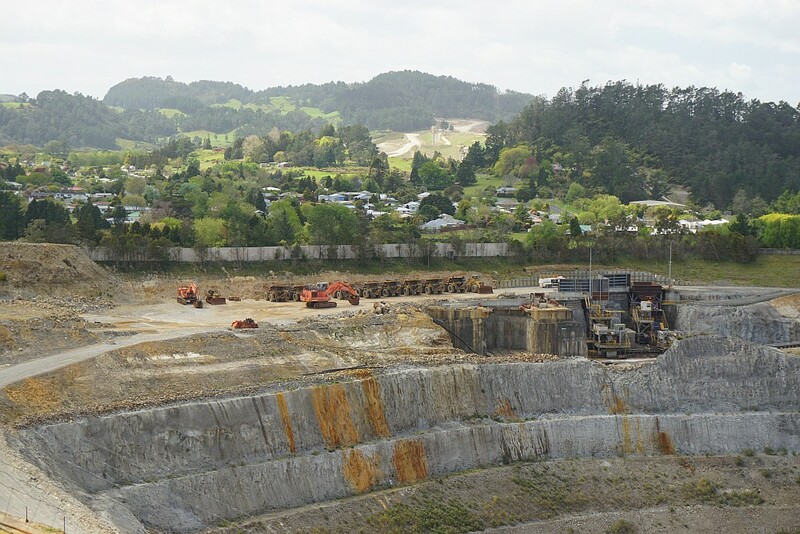 The mining company provides one kauri tree for planting in the district for each man-year worked on the mining operation. 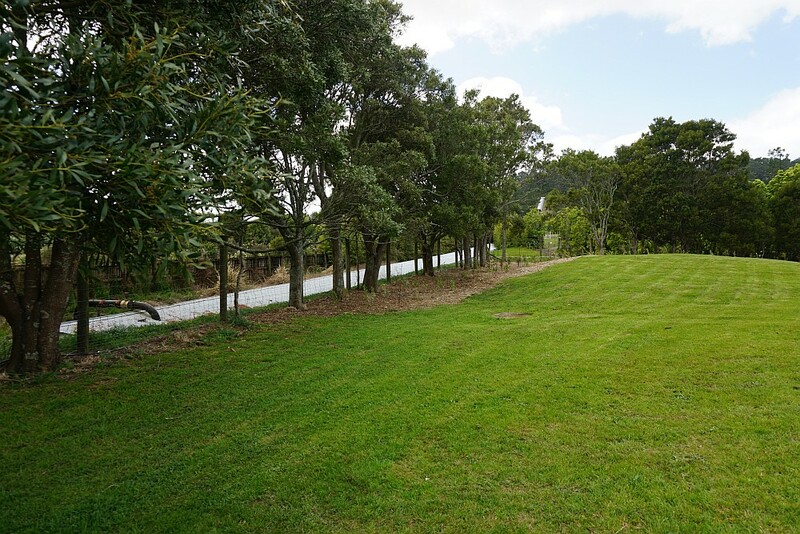 Over 1000 kauri trees have been planted. A few of them by the walkway. Information panels are present in many locations along the walkway, but unfortunately many of them have been damaged by vandals. Remains from old mining operations can also be seen. Here the concrete base from old buildings. The cover over the conveyor carrying ore from the pit mine to the processing plant can be seen here. It passes under SH25, and continues across the hill in the distance. 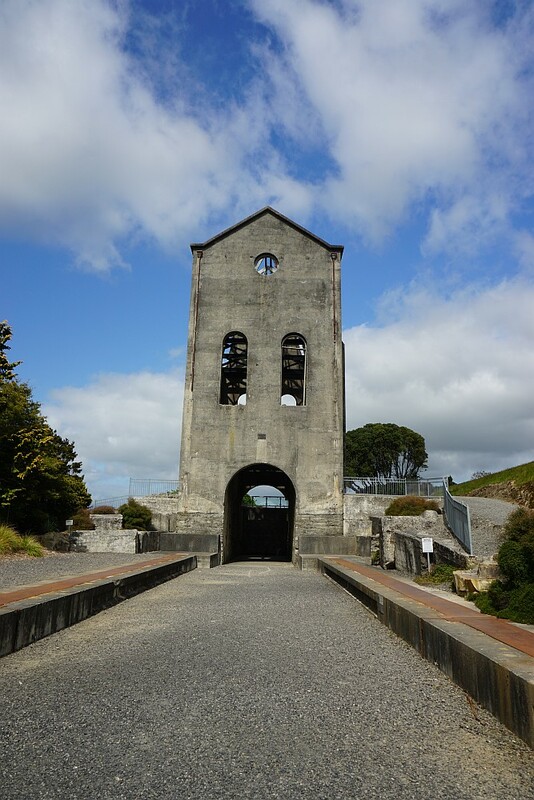 Back at the Cornish Pumphouse after walking the Pit Rim Walkway in a clockwise direction. Total distance walked was 4.3 km, with total time 1 hour 10 minutes. 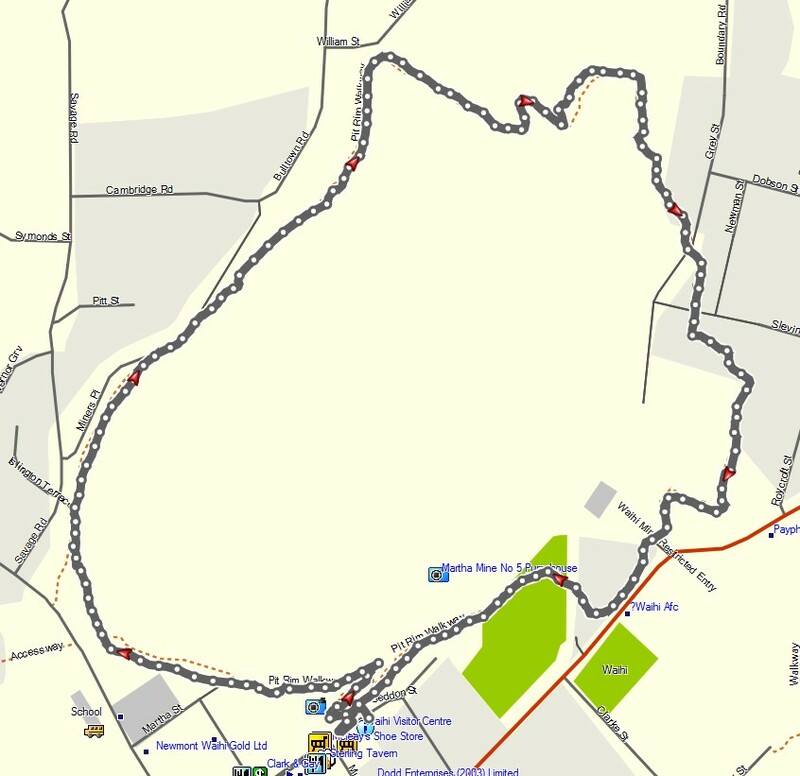 The GPS tracklog shows the route taken, with the track entry point at the southern end. 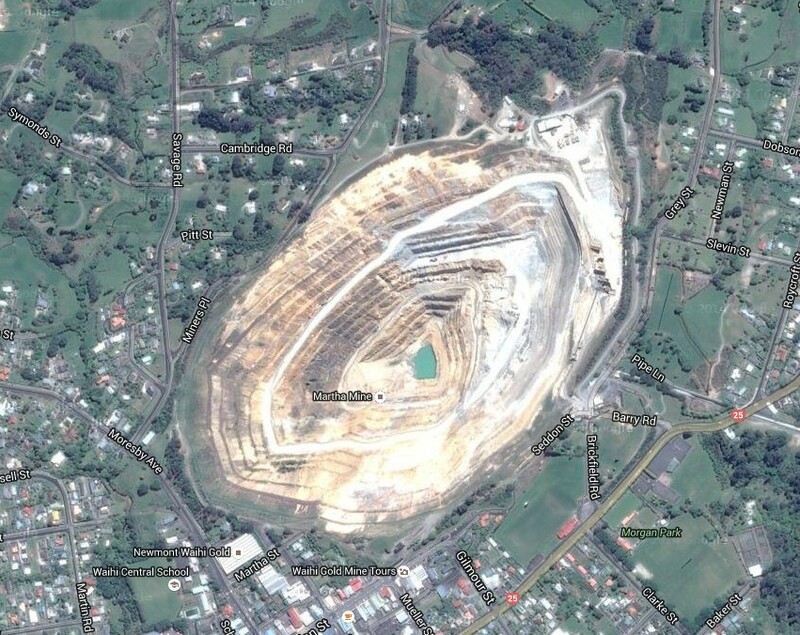 A satellite image from Google Maps of the area, with the mine pit clearly visible. The track was walked on October 20, 2015.